Internationally-acclaimed jazz pianist and composer Vijay Iyer will play with the Idyllwild Arts student orchestra at the REDCAT Theater at Disney Hall on Mother’s Day this Sunday, May 9 at 5 p.m. Tickets are $25, and proceeds go to Idyllwild Arts. Iyer, who is an old college friend of Peter Askim, the music director and composer-in-residence at Idyllwild Arts, performed one of his compositions at the concert last night at the IAF Theater. 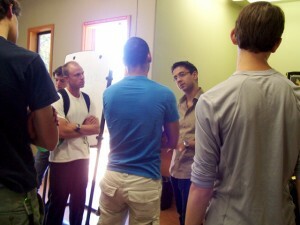 His piece, entitled “Interventions for Improvised Piano, Electronics & Orchestra,” was met with some skepticism at first. During an interview on You Tube, Iyer discussed that same concern with his “Interventions” piece. But this piece called for certain instruments to improvise, something that jazz musicians are used to, but not classical musicians who play in an orchestra. Well, their hard work paid off. 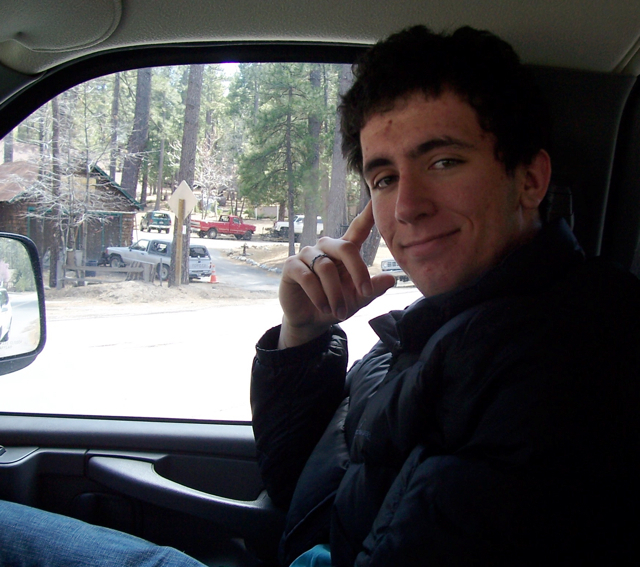 Last night’s concert was a success, according to James Duval, a classical flute player and the former head of the Music Department at Idyllwild Arts. At 10:30 p.m. Saturday night, the concert was over, and Duval was overseeing several students as they loaded up the truck with all of the instruments, including the bass drum. The truck is set to head down the hill Sunday at 9:30 a.m. in plenty of time for the 5 p.m. show at the REDCAT. Charles Schlacks, Jr., a former Russian History professor at Berkeley, was among those who attended Saturday’s performance on campus. He has amassed a classical record collection in excess of 40,000, but continues to enjoy live performances. In another interview on You Tube, Iyer said that he’s used to comments like that about his music. As background, Iyer earned a bachelors degree in math and physics at Yale. Although he studied jazz piano in high school, it wasn’t until after he graduated from college that he became a full-time performer and composer. Iyer mentioned that other musicians, even popular ones, do improvisations too. Not surprisingly, much of Iyer’s compositions are based on math principles. 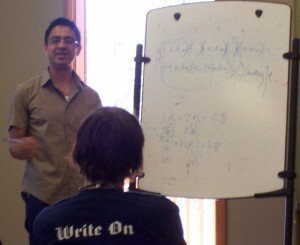 In fact, he gave a lecture on “Math and Music” to about 75 Idyllwild Arts students and faculty on Friday, May 7. There, he explained how math is integrated into music. “Usually, I don’t like music to be too hard, contrary to what you might believe,” Iyer said, amongst laughter from the music students. He outlined rhythm phrases that crossed over the beat in rhythmic progression, and gave the “A, B, A, B, A” pattern variables. He said that the challenge of being a composer today is to remain fresh, and always learning something new. Then he played some of his improvisations from an amplifier attached to his laptop. However, Iyer wasn’t the only one with an orchestra piece that was performed Saturday night. Askim, too, featured one of his pieces, a trombone concerto. “His piece was hard to play too,” said Connor. 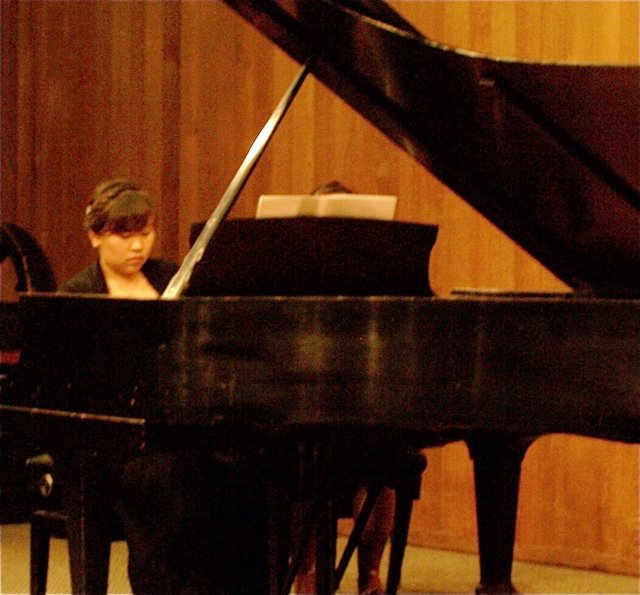 Senior pianists Ieseul, Linda and Daphne “Kitty,” each got to play different pieces with the orchestra. Ieseul said that she’s looking forward to playing at the REDCAT. “Any chance we get to go down the hill and perform before a live audience, is a good thing,” she said. Another good thing for the Idyllwild Arts student orchestra also happened this weekend. To hear that recording, visit iTunes at www.itunes.com. For tickets and more information about the RedCat performance on Sunday, May 9, at 5 p.m., visit www.redcat.org, or call (213) 237-2800. Tickets are $25 for the general public and $10 for students with I.D.